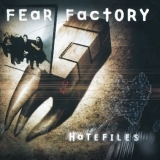 FEAR FACTORY - HATEFILES REMASTERED (DIGI) | Online Shop | Wizard LTD.
"Hatefiles" is a Fear Factory compilation album of rare, unreleased and remixed tracks released originally by Roadrunner Records in 2003. The album is notable as it contains "Terminate" the last song to be recorded with original guitarist Dino Cazares. The collection also includes the original track "Demolition Racer", a demo version of "Dark Bodies," and a slamming instrumental track, "Machine Debaser."